Creator Fruitdock launched the device on Kickstarter in March 2016. It rapidly hit its funding goal shortly thereafter in April, which brought with it the extra ability to function as a USB hub when powered down. Networking on the DoBox is provided through an Ethernet port and 802.11n Wi-Fi. Video out is provided over HDMI 1.2, and other connectivity options include audio-out, a pair of USB 3.0 ports, a USB-C input, and a microSD card reader. Through an iPhone app, the DoBox can create its own Wi-Fi network supplied by bandwidth from an existing wireless source, or from the Ethernet port. The device is powered via either USB-C or its internal 8,000 mAh battery. The same battery can charge other devices over USB-A connections. The DoBox is very finely machined -- and also quite dense. The one-pound unit comes in at just over 5 inches square, and is about three-quarters of an inch tall on a table. The aluminum finish picks up fingerprints and "seasoning" from handling readily, but is also easily cleaned with a screen wipe or just a damp paper towel. There is no conventional power switch on the device. Turning it on is done with a circular swipe on the power level indicator panel on top. It takes about 16 seconds for the unit to fully boot. This is a little awkward, in practice. While the DoBox is designed to be self-enclosed and as "Apple-like" as possible, a physical switch would have been better. The DoBox includes a USB-A to USB-C charging cable for use with a wall adapter. The company recommends a USB 3.0 or newer Type-A or Type-C port to get the full 1 amp of charging power. From empty to full, using an Apple iPad power adapter, it took three hours to charge the accessory's battery. Sharing a wireless network connection went off without a hitch in our testing. We tried both connecting to Ethernet and sharing public Wi-Fi with a peak of 9 devices, and encountered no issues other than those induced by congested Wi-Fi traffic. The range of the connection shared from the DoBox looks to be about 12 feet before signal drop-off or other connection problems manifest. One of the basic premises of the DoBox is simple filesharing between macOS and iOS. The device is supposed to connect through an SMB share -- but using macOS Sierra, we had difficulty with that method. Connecting to the device with its native IP address was easier. Even at very close range, data transfers were slow. The max speed we reached was about 15 megabytes per second to internal storage. We connected a Mushkin Ventura Ultra 120 gigabyte SSD to a USB 3.0 port and found that after the internal storage was filled, transfers quadruped to around 60 megabytes per second. So the speed limitations don't appear to be because of Wi-Fi problems, but because the flash media just couldn't write data any faster. At the moment, on the iPhone, there doesn't appear to be a way to get files out of the DoBox to another app, like a PDF reader. To circumvent this, a number of file viewers have the ability to connect to an SMB share directly, and connecting them directly to the DoBox works. However, even given the USB hub feature of the device, we couldn't locally mount the storage when physically connected to a MacBook Pro. This wasn't promised as a feature, but it seems like it should have been. The DoBox advertises itself as a way to use a keyboard and a mouse on an iOS device. It's not quite that simple, though. Apple has made a big deal about how there's no need for a pointer other than an Apple Pencil or a finger. As such, its APIs aren't really mouse-friendly. The DoBox's creators should eventually release a developer kit allowing for use of a mouse in an iOS app. There's no good way to test that at the moment, though, beyond the DoBox's app built-in screensharing client and notepad features. Bluetooth doesn't work, yet. Both the DoBox we were provided for review and the accompanying software were pre-release. As part of the Indiegogo campaign, we were promised that you could connect to a Mac from an iPad when on-the-go, and control it remotely. This is where connecting a mouse to the DoBox pays off. It's also a bandwidth-limited solution however, reliant on how good of a connection you have on both ends. We've got Verizon FiOS gigabit fiber at the AppleInsider D.C. branch, so that effectively rules out bandwidth problems at one location. At schools and libraries, we had no problems remotely using a wired 2012 Mac mini. Starbucks and McDonald's didn't go so well. It appears the threshold for acceptable remote use is about 8 megabits up and down, with a relatively powerful router on both ends. The HDMI port functions as expected, if all you want is video out. If you need audio too, then you need to run a cable from the audio-out port to an input somewhere else. This isn't a bad thing if you rely on a HDMI-to-DVI connector on an older projector, and rely on an audio-out connection for the speakers in the unit. For everybody else, it might be an annoyance. The long and the short of it is, if you have an Apple TV, use that for AirPlay. If you don't, this will (mostly) work. In the interests of full disclosure, our pre-release period with the device wasn't smooth -- but that's the case with just about any new product. 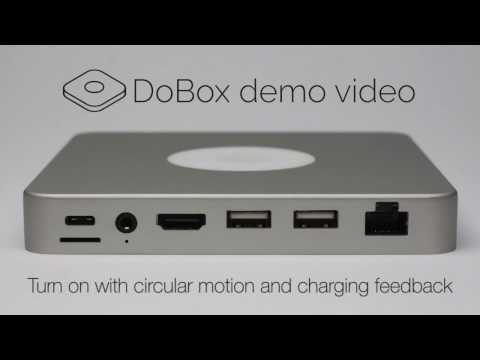 The DoBox developers have proven very capable of issuing both hardware and software updates. A fully supported device is leagues better than one released half-baked and forgotten. Kudos for the improvement initiative. But... what is the use case? While out and about with the DoBox, we got asked a lot of questions about it -- including but not limited to "what does it do," "what's it for," and "why do I need one." We never had a good script for those questions. They were best answered by asking about a person's possible needs and going from there. The DoBox with its own router would be good for a presentation in a congested Wi-Fi area so you can have your own little unclogged network -- but not necessarily projected from the DoBox's HDMI port, given that audio out is through a headphone jack and not HDMI. Got to move files to an iPad? Using the DoBox and its app is a good solution -- but transferring the files via iTunes filesharing may be better, depending on what you need. As it stands, the DoBox replaces a bunch of other single-function devices and cabling. No longer is there a need to shlep around a Lightning flash drive, a travel router, a Lightning-to-HDMI adapter, and a slew of other connectors. As a bonus, it'll connect USB-A devices to a USB-C computer like the 2016 MacBook Pro when not in use. The box doesn't connect using UASP, so the functionality is rudimentary, but it is there. When you see the DoBox, and what it can do, you know already if it'll simplify your life as a universal adapter of sorts. It's just a hard sell if you only need to do one thing that it can accomplish. AppleInsider gives the $199 "early bird"-priced DoBox a 3 out of 5 as it stands today -- with a great deal of potential for future improvement. Given that the company is highly responsive to the wants of its consumer base and isn't afraid to issue fixes, we'll revisit this later as the software matures, and we're looking forward to what we discover. Thanks for the review, the only reason I am buying this device and hopefully it will work as expected is to use my iPhone as desktop when I am in the office by connecting the phone to external screen, mouse, keyboard and external hard drive. For sure there will be some issues in the beginning but hopefully the developers can solve it with the future update again I hope it will work as expected and waiting for my device on June. Please post again when AI revisits this product. I'll be interested to hear how you get on.